Have you ever stared at a blank page wondering what to write? (Glad I’m not the only one!) Wouldn’t it be nice if your blog readers told you what they wanted to read? Here’s the deal. They already have. Your Google Analytics data is a gold mine of reader and consumer information. Let’s dig in. How do people find you online? People find your website a lot of ways, but the one that you’ll want to capitalize on is search traffic. Find out why people visit your site, then give them what they want. Say you’re in the gold mining equipment business. Prospects might be searching “how to pan for gold.” If you have content on your blog that answers that question, you’re one step ahead of the competition. You can see the keywords that prospects are using to find you from search and how much traffic is coming from those searched keywords. You can find this in your Google Analytics dashboard under Acquisition > Search Engine Optimization > Queries. Filter out any brand name or buyer-related keywords first. Now you see a list of phrases for which you already rank. Use keywords to pick blog topics. The keywords generating the most traffic are your sign to start digging deeper. Mine those keywords by digging into more specific information related to them. You may find that you have a huge vein of blog topic gold that will keep you writing for weeks or months. The Top Gold Mining Companies in the U.S.
Each of those topics could be split up and refined into more specific sub-topics. There are likely already blog posts for some of these same topics, but that's totally fine. Searchers aren't looking for you to reinvent the wheel. They just want your expert opinion. Find a way to put your own spin on common topic. How to pan for gold. How to stake a claim in Montana. These are all just scratching the surface. You can find hundreds more ideas by plugging a couple broad keywords you found in Google Analytics into KeywordTool.io. This website can show you many related keyword phrases you can use to develop more blog topics. If you aren’t ranking for a keyword for which you’d like to rank, then you need to start producing a stream of fresh content containing that keyword. Google’s algorithm favors content that answers questions with useful information. Provide specific answers to specific questions. What do people want once they’re on your website? To find out what people are searching for when on your site (assuming your site has a search tool), check out the search traffic in your Google Analytics dashboard under Behavior > Site Search > Search Terms. These terms are for content that people already want to find on your site. Blogging to hit these needs is a little like picking up a gold nugget from a river bank. Easy. Pageviews: which pages or blog posts are the most popular? Average time on page: longer time on page means people are actually reading. Low average time on page can mean there was a misleading blog title, slow load time or that the post was too long. Conversion rate: if you have relevant calls to action (CTAs), are people actually clicking? User on-site behavior: where do people go after viewing individual blog posts? Demographics: who is reading your blog? If your readers are all women ages 29-35, you need to address them, not men ages 45-55. Think of blog topics that would appeal to and address the specific needs of your audience. Writing a powerful blog starts with picking great topics that address your readers’ specific questions. Readers give you this information by the search terms they use to find your site and the pages and blog posts they interact with the most. 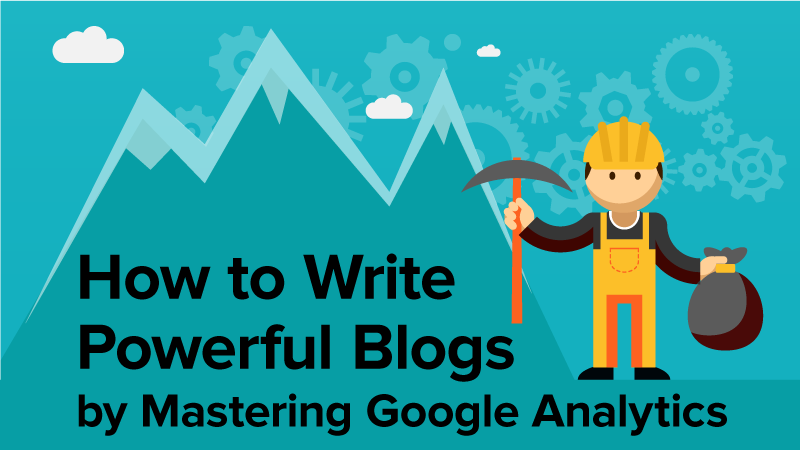 Drill down into the data in Google Analytics to keep generating content that meets those needs. If you keep digging deeper, you may just strike gold.